AMSTERDAM and CHICAGO, Nov. 26, 2017 /PRNewswire/ -- Royal Philips (NYSE: PHG, AEX: PHIA), a global leader in health technology, today announced the debut of IntelliSpace Portal 10, the latest edition of Philips' comprehensive, advanced visualization and quantification platform. This next generation features enhancements across the solution, with a particular focus on oncology to provide radiologists with an improved full set of applications and workflows to support the reading and follow-up of complex oncology cases. IntelliSpace Portal 10 also includes a new 3D modeling application and has been expanded with the DynaCAD Prostate and Breast solutions through integration with InVivo. IntelliSpace Portal 10 has been expanded with the DynaCAD Breast solution through integration with InVivo. IntelliSpace Portal 10 has been expanded with the DynaCAD Prostate solution through integration with InVivo. IntelliSpace Portal 10 features an embedded 3D modeling application. Interest in 3D imaging and printing for healthcare continues to grow as health systems see the value of its integrated workflows in areas such as surgery planning, education and training. IntelliSpace Portal 10 is the first solution to feature an embedded 3D modeling application for creating and exporting 3D models intuitively into the clinical workflow. 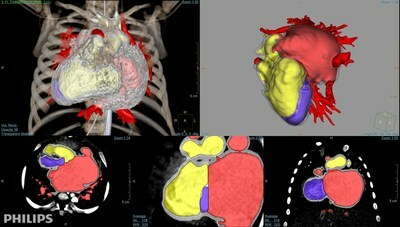 Building on its long-term strategic partnership with Philips, Phoenix Children's Hospital leverages the solution to enable clinicians to use the new 3D modeling features for clinical applications to help improve patient care. "Our collaboration with Philips has accelerated the co-creation of solutions designed to address the unique needs of pediatric patients," said Dr. Dianna Bardo, Director Body MR and Co-Director 3D Innovation Lab, Phoenix Children's. "The 3D modeling application of IntelliSpace Portal 10 has been instrumental in receiving a more accurate picture of the details of anatomy. This is especially true as we prepare for complex procedures by determining the tumor's exact size and seeing subtle changes over time; informing the most viable treatment choice." IntelliSpace Portal 10 aims to enhance definitive diagnostic confidence to assist in driving improved treatment and outcomes, support appropriate imaging and treatment, simplify data and insight gathering and reduce costs. Intelligent and adaptive, the solution is responsive to the needs of radiologists and includes a machine learning feature that automatically learns from prior application usage to predict the series and data type on which pre-processing should be applied. IntelliSpace Portal 10 will give clinicians and radiologists a single, vendor-agnostic platform to provide them with the sophisticated tools needed across the continuum of care for oncology. As the prevalence of cancer and its economic impact increases, solutions like IntelliSpace Portal 10 will play a large role in supporting physicians with diagnostic confidence and patient care. In collaboration with InVivo, a business of Royal Philips focused on advanced clinical visualization systems and MRI-compatible interventional devices, DynaCAD Prostate and Breast capabilities will be directly integrated into this latest edition of IntelliSpace Portal. 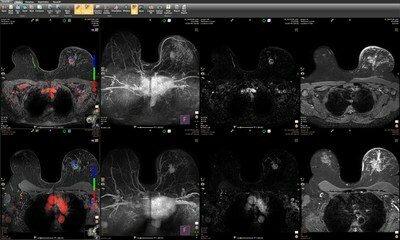 DynaCAD Prostate and Breast, high-performance advanced image analysis solutions that feature flexible workspaces with custom hanging protocols, image post-processing, lesion segmentation, standardized and structured reporting and interventional biopsy planning, will help reduce processing time to assist with enhanced disease management. "IntelliSpace Portal 10 highlights our continued commitment to create advanced visualization platforms that offer a single integrated solution for fast, efficient workflows and increased diagnostic confidence, especially in a value-based care environment," said Yair Briman, Business Leader Healthcare Informatics at Philips. "This new edition marks Philips' ability to provide one comprehensive solution to answer our customers' needs, such as clinical improvements and increased efficiencies, especially now with the integration of two important clinical domains of breast and prostate cancer." Philips recently signed agreements with 3D Systems and Stratasys, two of the leaders in the 3D printing industry helping to accelerate medical progress in improved planning and patient outcomes. Philips customers now have seamless access to expedite 3D printing to create models to help physicians understand patient anatomy that is difficult to visualize, and deliver personalized medicine in the most unique, complex cases. As interest in 3D printing continues to grow, its role in radiology is still being defined. Hear directly from clinicians as they employ new technologies for 3D integrated workflows to print models leveraging 3D segmentations, education and training at the Philips hosted 3D Printing Symposium on November 28th from 9 – 10:30 a.m. CT at S101AB, McCormick Place, Chicago. The symposium will feature speakers from Phoenix Children's Hospital, Ichilov Hospital in Tel-Aviv, and Philips. Philips has collaborated with Ichilov Hospital to integrate 3D surgical visualization and planning into their 3D surgical hub. For more information and to RSVP for the event, visit www.philips.com/rsna. To learn more about IntelliSpace Portal 10, visit the Philips booth #6735 at the Radiological Society of North America (RSNA) Annual Meeting, taking place Nov. 26 - Dec. 1, in Chicago, Ill. For more information on Philips full suite of integrated imaging systems, devices, informatics and services at #RSNA17, and for live updates from the event, follow @PhilipsLiveFrom or visit www.philips.com/rsna.